We have a US only giveaway that ends on 1/20 here. We've had plenty of these Brentwood Home giveaways recently and this one is late to the game but still a great prize. Good luck. 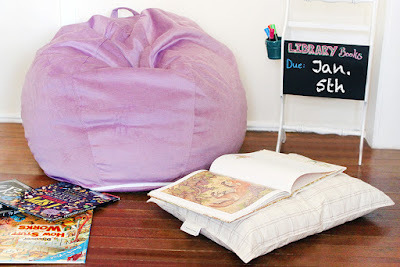 Welcome to the Brentwood Home Kids' Space Bundle Giveaway! I’ve got a bundle for you that’s sure to turn naptime into their favorite time. Holly from Southern Mom Loves teamed up with the folks at Brentwood Home for this awesome giveaway, featuring comfy bedroom essentials for your little ones. Not only are they adorable with fun colors and playful patterns, they’re made with healthy, natural materials that are safe for you and your home. Read on to win! This bundle from Brentwood Home contains two of their most popular kids’ products – the Venice Lounger and the Lilypad pillow. The Lounger has a plush, hugging sensation, so your child feels cradled and secure no matter where they’re hanging out. It’s the perfect place for their “me” time, where they can read, snooze, create, and relax freely. Made with nontoxic polyurethane and gel memory foam, it’s perfectly cozy and kid-safe. For the health-conscious parent who wants the most natural night’s sleep for their child, the Lilypad pillow is the perfect resting place for sleepy heads. It’s filled with a mixture of silky smooth kapok, plus the texture of bouncy, all-natural latex. The Lilypad’s cover is detailed with a delicate plaid pattern for a playful touch. Plus, it’s made using 100% organic cotton, so you and your child can both sleep safe and sound. Read Holly's review here, then enter to win it for yourself! Giveaway begins on 12/30/16 at 1:00 am CST and ends on 1/20/17 at 11:59 pm CST. Must be 18 years or older, open to residents of the US only. Once confirmed, the winners will be added to the Southern Mom Loves Winner's List. Disclaimer: The participating bloggers were not compensated for this post. No purchase is necessary to enter. One entrant per household, per IP address. All entries will be verified. Void where prohibited by law. Winner will be contacted by email; Please add southernmomloves@gmail.com to your whitelist. Brentwood Home will be responsible for prize delivery to the winner. This giveaway is in no way administered, sponsored, endorsed by, or associated with Facebook and/or Twitter, Google, Pinterest, or any other social media platform. I really like the Runyon Deluxe Pet Bed! My Husbands Dog would love this!! I like their memory foam mattresses. This company is up and coming. I really like the Runyon Deluxe Pet Bed, although I'm pretty sure my cats would ignore it. I think my mom's 3 little Yorkies would love it. I like the RUnyon Deluxe Pet bed. Either one of our dogs would love this!! I love that they have a variety of mattress options. I’d love to upgrade to a spring hybrid mattress with the comfort of gel memory foam plus with the support of individually wrapped coils. I like the bamboo 7 looks so nice and great for kids. I like the Palmetto Mattress they say it's soft but firm. I would love to have the memory foam mattress or even the pillows. I like the gel memory foam mattress or the other mattress options. Would love to use the Aliso Feathered Gel Pillow, sounds very soothing! The sonoma sheet set would be put to use in our house. Ours could use updating and replacing for sure. This company has many great products and lots of variety to appeal to consumers. I really love the honeysuckle nursing pillow and the sweetpea changing pad. Thank you for the giveaway. I would like to try the bamboo gel mattress. I am intrigued by al the options now in these products. My favorite would be the Griffith Pet Bed. I like the Trout Blue color in extra large. I love the Runyon Deluxe Pet Bed. ive never heard of a latex mattress before, so the mirador looked interesting. im not a fan of my foam. I love the latex mattresses. You have a lot of wonderful products, the foam matress looks so comfortable. I think my daughter would love the chair and pillow. I think I might have to get one for my granddaughter too, her birthday is soon. Thanks! I really like their selection of mattresses. The latex foam mattress would be my top choice! any of the memory foam mattresses would be so nice and soft! i also like their Pacifica Gel Memory Foam Pillow. The Sequoia Mattress is what I really want, with Pacifica Gel Memory Foam Pillows. It just sounds dreamy. I love the Linen Quilt in white. Itbwould be a great foundation for my bedding. I like their Wildfern 2-Stage Crib Mattress ! Really love the honeysuckle nursing pillow. Looks like great quality! Their mattresses all look great! I love that there's such a variety. I would like the Oceano Mattress. I like that it is a medium-plush feel offer that soft, hugging sensation without sacrificing support. The Griffith pet bed would be a great addition to our household. I love the Aliso Feathered Gel Pillow because its medium firm. I like the Runyon Deluxe Pet Bed,my dog would love it! I like the Pfeiffer Gel Foam Wedge Pillow. I don't know that I can actually comment on a product that I don't own, but would like to...the Bamboo Gel 13 mattress is really something I could "sink" into -- it looks so stylish and comfy. One day, when my luck turns, it's going to be MINE'S!!!! I'm loving the Runyon Deluxe Pet Bed, my old girl would love it too! I love the Runyon Deluxe pet bed for my fur baby and the dewdrop pillow or bamboo gel 7 mattress for my baby baby!! i can beat up my brother with this. The memory foam mattress seems really nice and like it would be super comfortable.